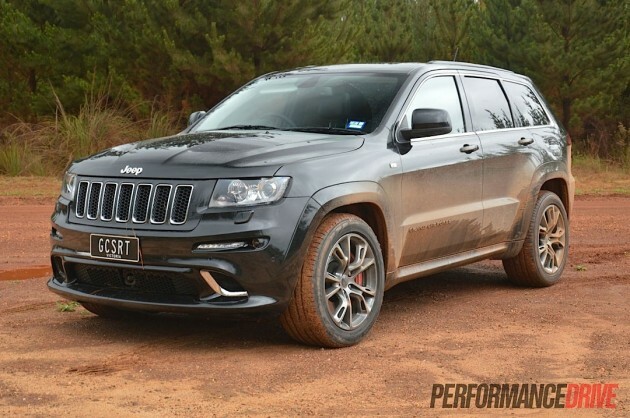 With a 6.4-litre HEMI V8 lurking under the bonnet producing an anabolic 344kW, the 2013 Jeep Grand Cherokee SRT8 is about as close as you can get to a brand new road-legal monster truck. It’s bloody awesome. 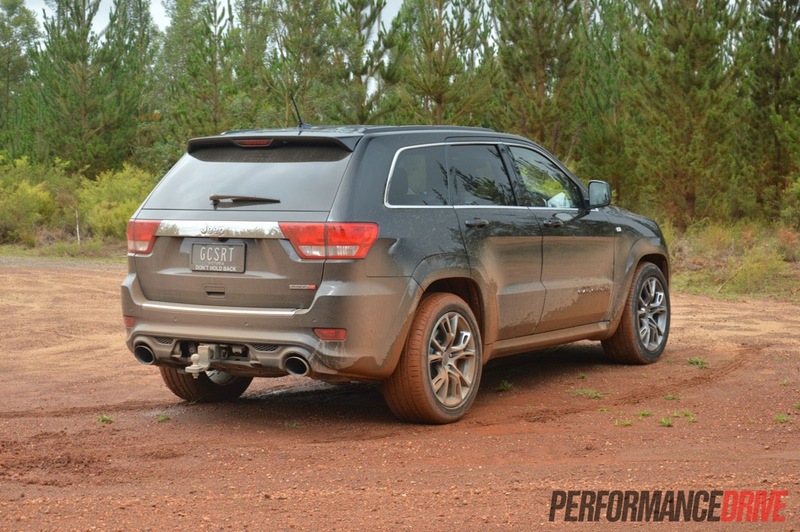 The 2013 Jeep Grand Cherokee SRT8 wipes its bum on the quiet, polite, shirt-tucked-in conventions of what an SUV should be. Let’s get one thing straight from the beginning, this is a muscle car with one main mission; to put a smile on your face. It’s way more than a humdrum machine designed simply to get you places. 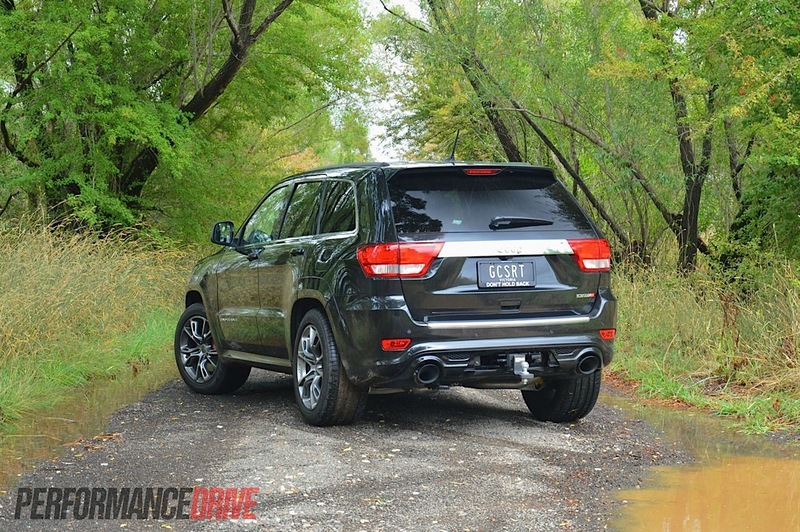 The MY2013 SRT8 was released in September last year. 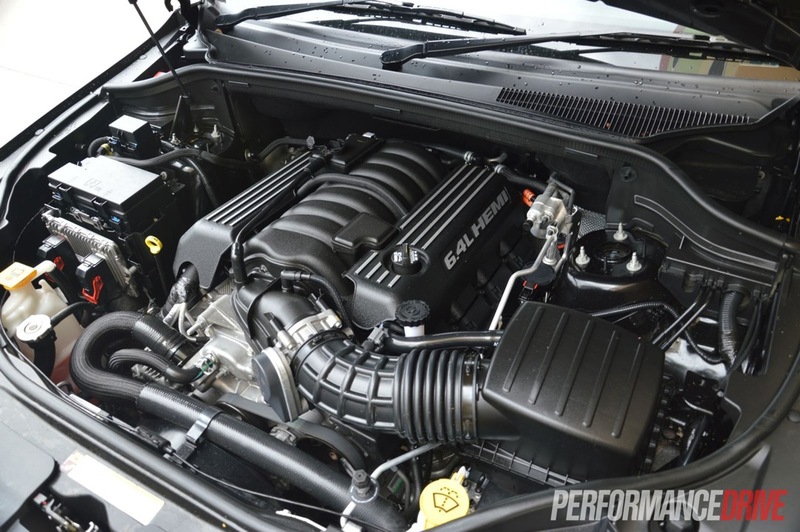 Although there are no major changes for the MY2013 over the MY2012, all of the performance concessions remain, including the big 6.4 HEMI V8 which produces 344kW of power and 624Nm of torque. 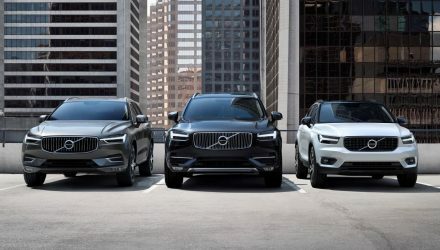 It’s matched up to a five-speed automatic transmission – a new eight-speed auto will be introduced with the facelift later this year. 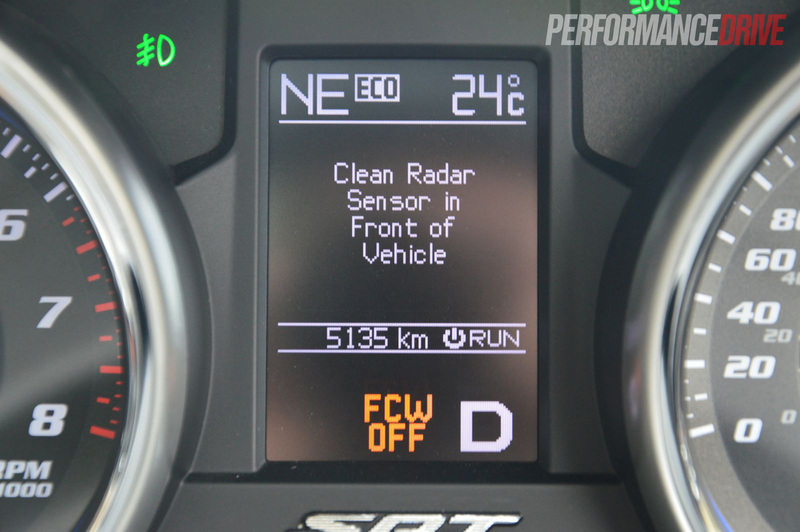 Anything with an ‘SRT’ badge on it (street and racing technology) means it has been developed for driving enthusiasts with a distinct performance-oriented edge. 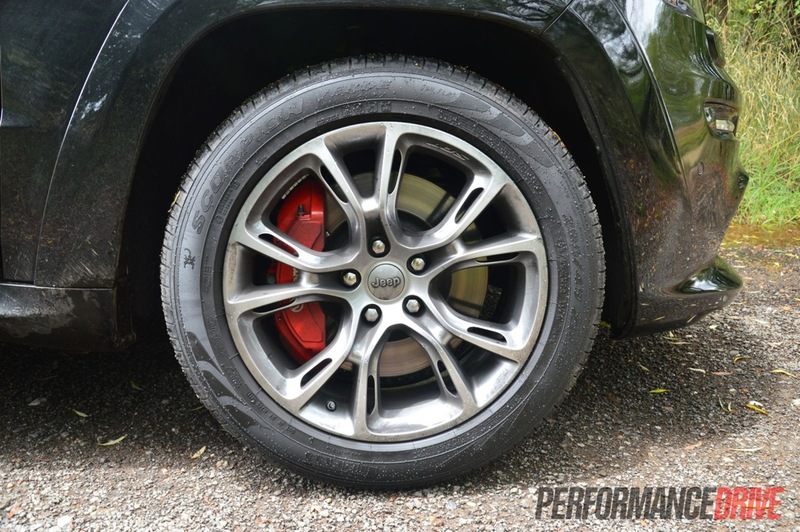 Almost every aspect of the Grand Cherokee is touched by the SRT philosophy, including the body, the wheels, the brakes, the suspension, and the interior. All have been given a performance makeover. As for the price, this is an area where the Cherokee SRT8 truly surprises and stands out in a class of its own. It’s available from just $76,000. 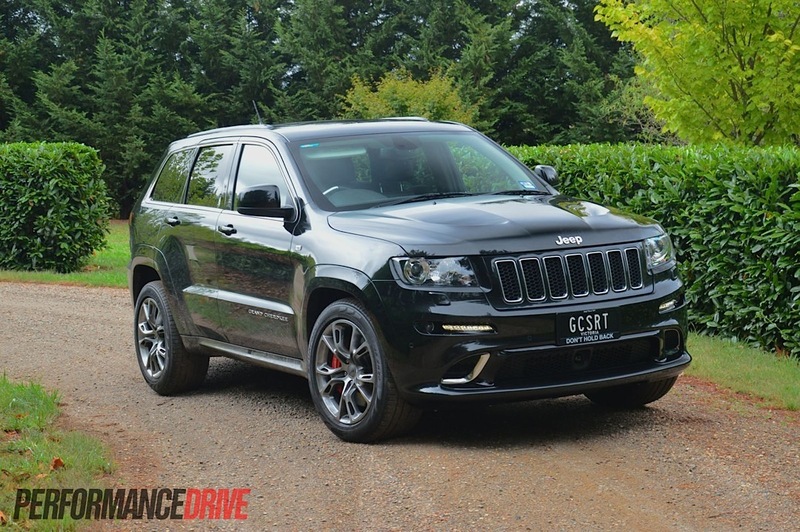 This makes it easily the most accessible brand new high performance SUV on the market, with its closest rivals, the BMW X5 M (408kW) and Mercedes-Benz ML 63 AMG (386kW), sitting at least $100,000 north. 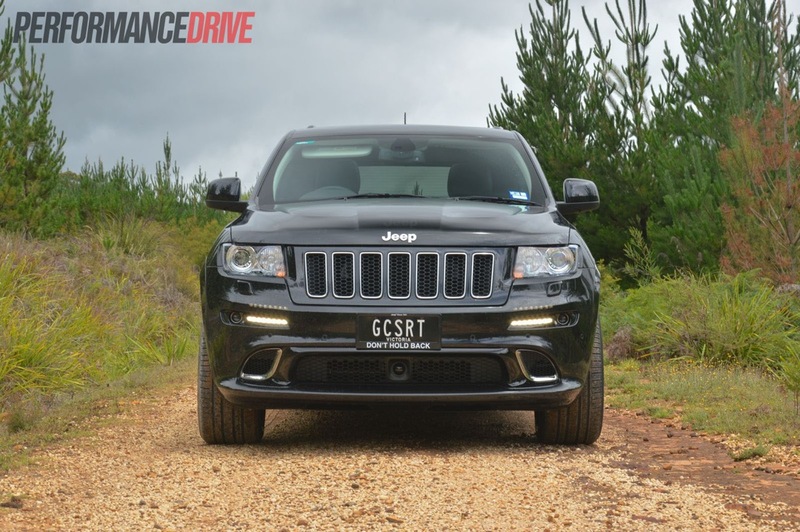 The SRT8 is the flagship model of the already top-line Jeep Grand Cherokee range. 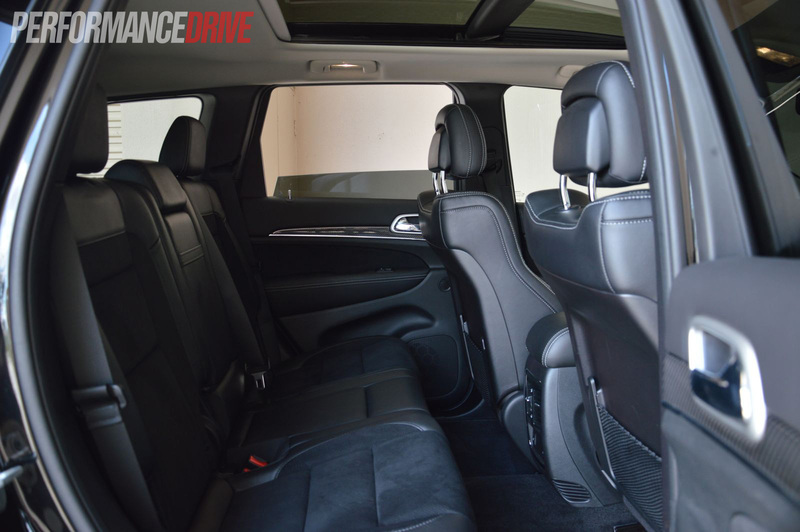 It’s filled with the company’s latest technologies and luxuries. 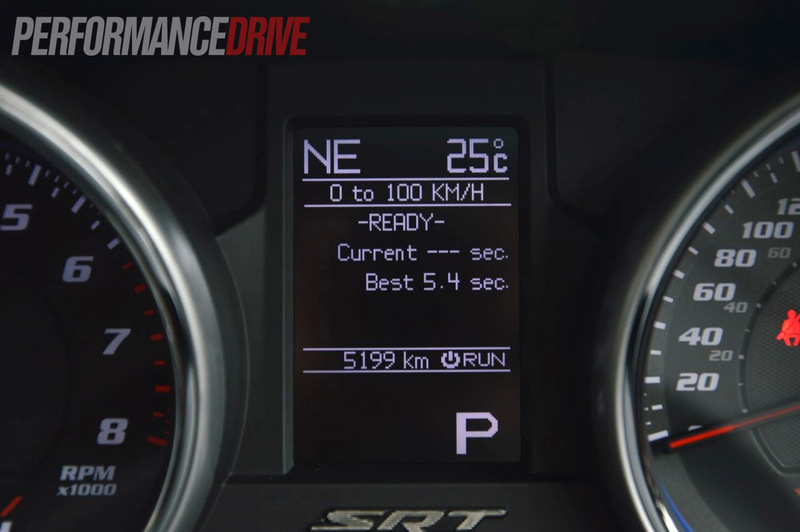 The SRT8 packages them all together, and adds more, such as the ‘Performance’ menus and ‘Selec-Track’ driving modes. 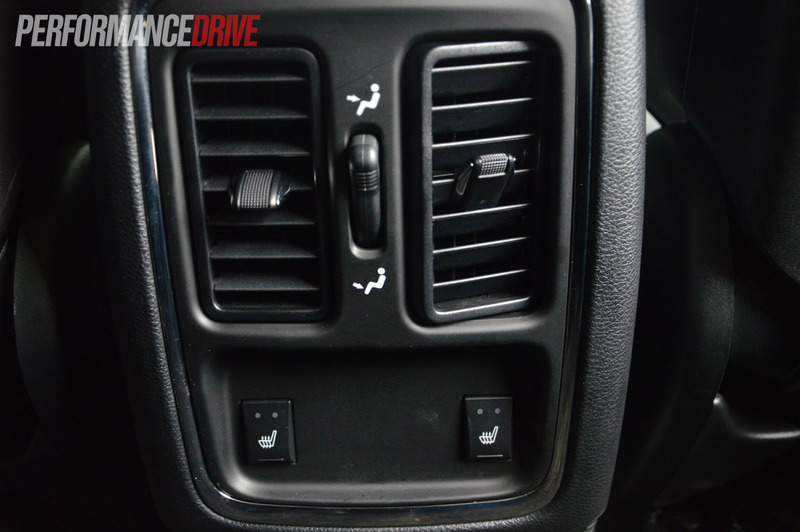 We’ll go through the different modes in more detail in the drive section below. It’s got everything you need in here, there’s electric bucket-style seats which aren’t full leather, in a good way – they feature more comfortable (in our opinion) suede inner sections which breathe easy – the steering column is electronically adjustable, there’s auto headlights and wipers, a heated steering wheel, an electric tailgate, and there’s also radar-guided cruise control with adjustable distance settings. All of it works very well and makes your journeys relaxed and comfortable. You do have to keep the radar sensor in the front bumper bar clean in order for it to work, understandably, as we found out. 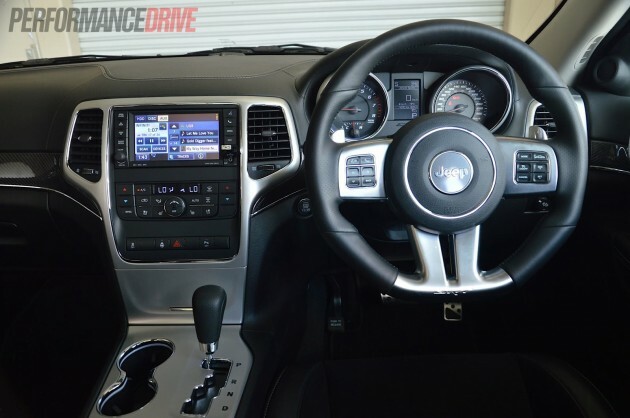 In the centre fascia of the dash is a comprehensive multimedia interface with satellite navigation. 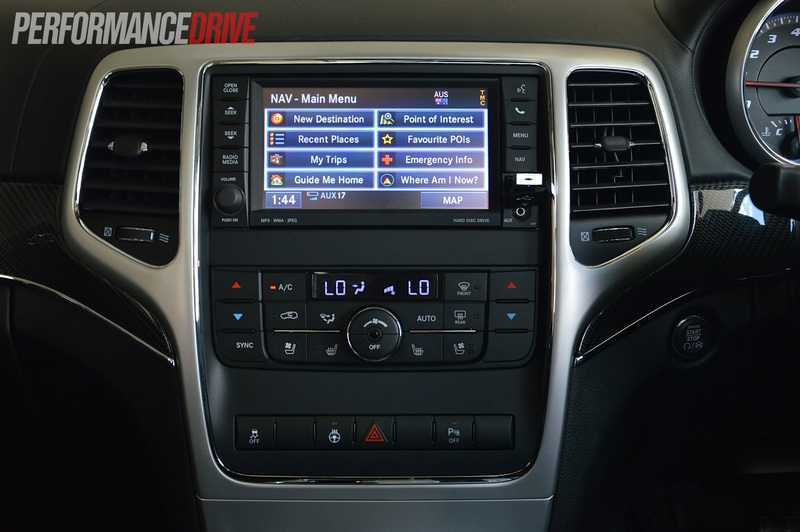 It can connect up to all of the usual devices a modern driver would need, including USB and Bluetooth. It also comes with voice recognition and a DVD player mode. 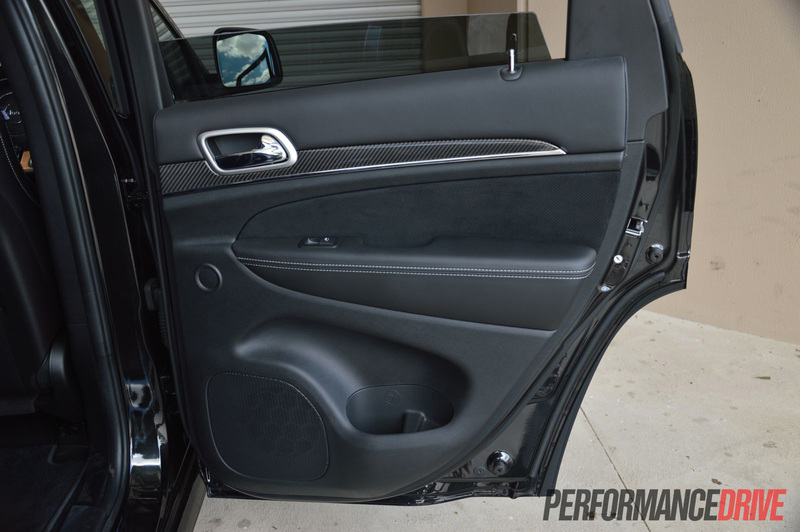 As for the stereo, a powerful nine-speaker premium system is standard. 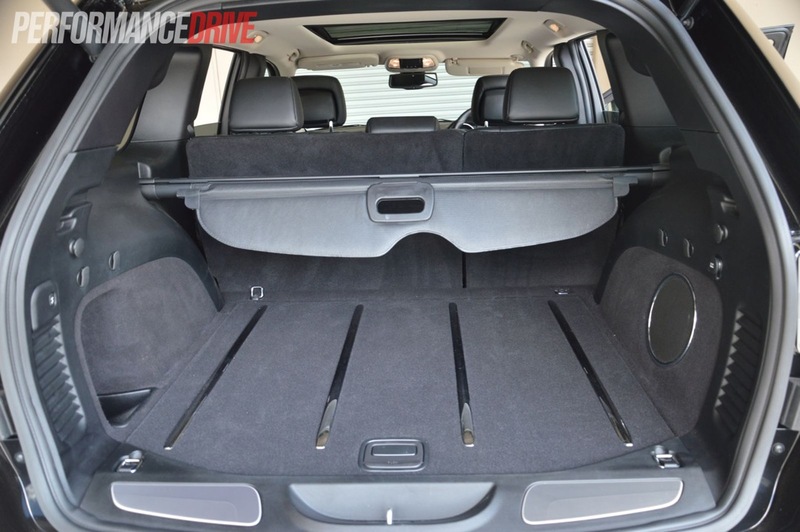 Optioning up to the $1200 19-speaker high performance sound system with a sub-woofer in the cargo area is pretty much mandatory in a vehicle like this (as tested). 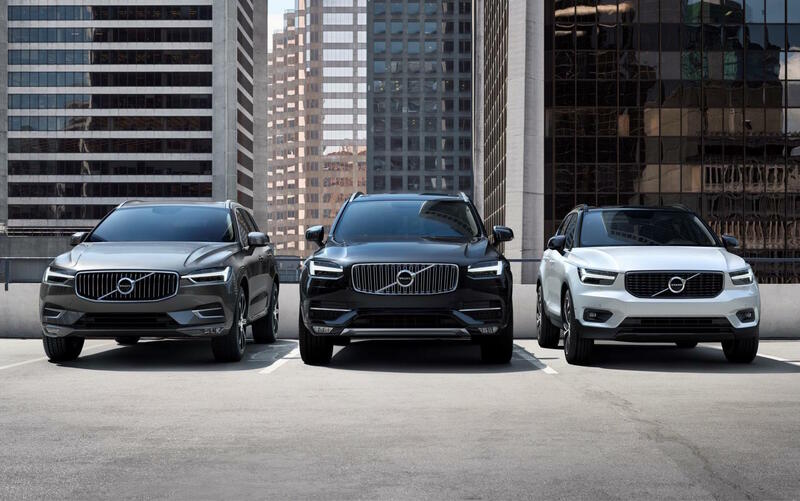 It goes hand in hand with its personality. As we discovered, the unit provides awesome clarity and plenty of oomph and bass when you really crank it up. If you option for the huge sunroof ($3900), you also get the 19-speaker system. In terms of performance equipment, SRT has incorporated a very good Bilstein sports suspension setup, lowering the Grand Cherokee by 25mm. 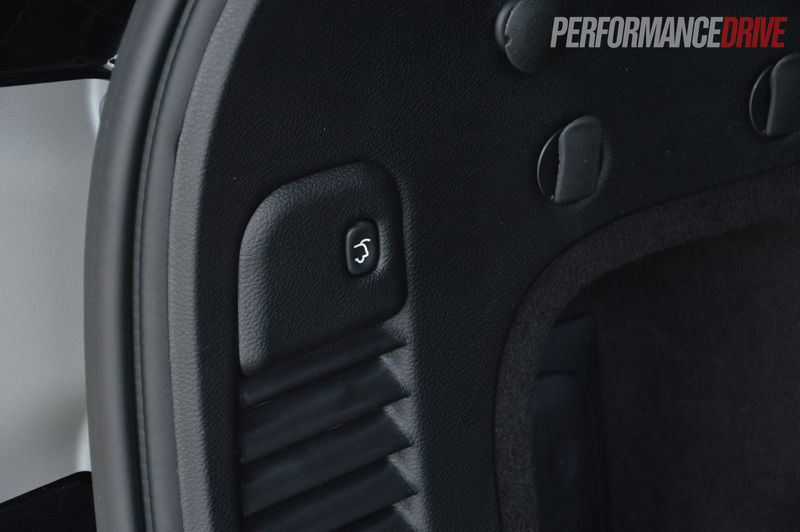 It’s adjustable via the different driving modes; auto, sport, and track. There’s a limited-slip differential in the back too and a torque-proportioning transfer case for the all-wheel drive gear. 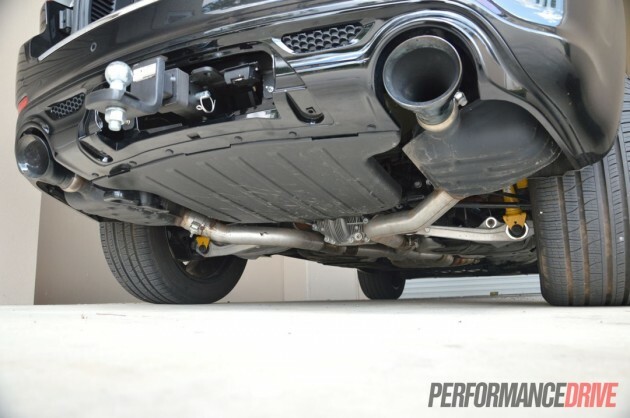 You also get 20-inch alloy wheels wrapped in huge 295/45 ZR-rated tyres, a bodykit with slightly bolstered wheel arches front and back, a more aggressive front apron and grille section, and a twin-outlet – ‘trumpet-outlet’ we should say (see below) – exhaust system. It’s one of those designs that you can’t really argue with. Literally, if you tried, it’d stare you down until you backed away. 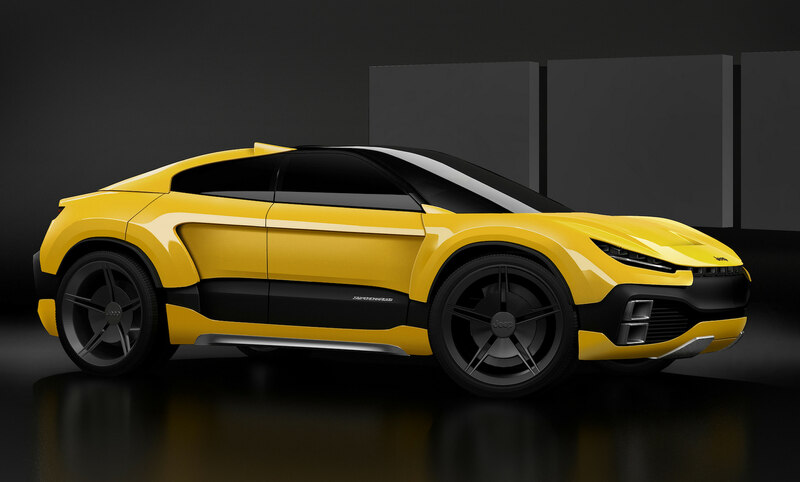 It’s imposing, clean-cut, and somewhat toned with hard edges. It’s a masculine machine, no doubt, but it also steams some hints of class and luxury, almost purely thanks to its enormity. Measuring just under five metres in length (4822mm) and almost two metres in width (1943mm), there’s no getting away from the fact this is a large vehicle. It can be a bit difficult to park sometimes, especially in tighter streets and car parks, or simply driving through your local takeaway joint. With all this size you do feel a bold sense of security the moment you step inside. 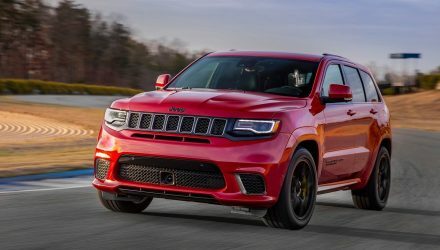 Feeling secure doesn’t necessarily translate to safety, however, Jeep says the SRT8 is fitted with 45 different safety and security features, which reinforce that sense. 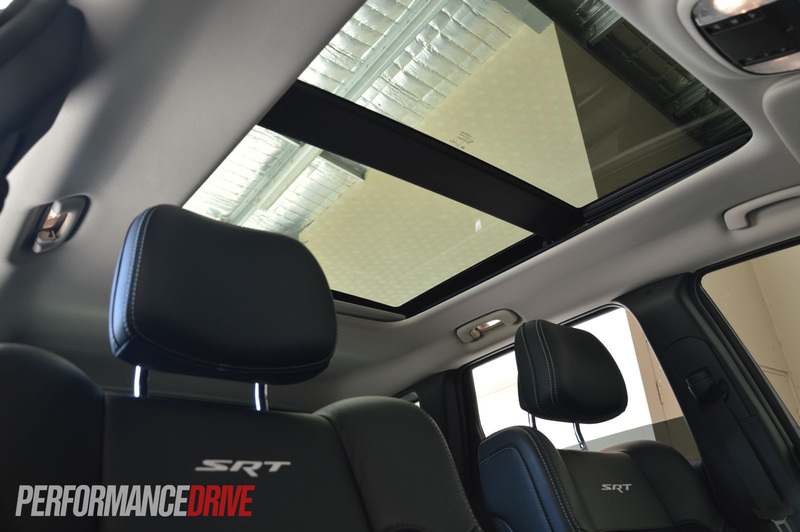 Standard safety tech includes multi-stage airbags (nine in total), stability and traction control, and a set of huge Brembo brakes with six-piston calipers on the front and four-piston units on the back. 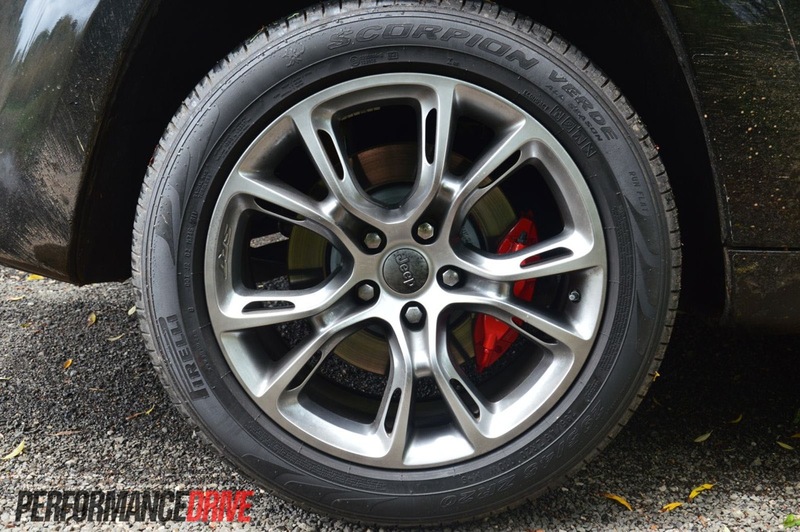 We found the brakes do a commendable job most of the time. During repeated abuse, the pedal tends to drop and there is some fade. But hey, what do you expect from a 2336kg heffer? 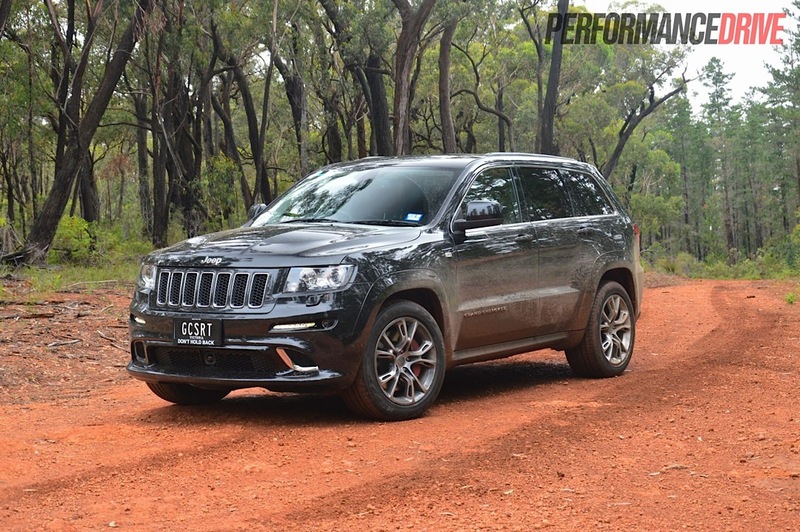 Australia’s ANCAP hasn’t tested the flagship SRT8 model, which comes with all the fruit, although, it did test a diesel version back in 2011 and gave it four stars. 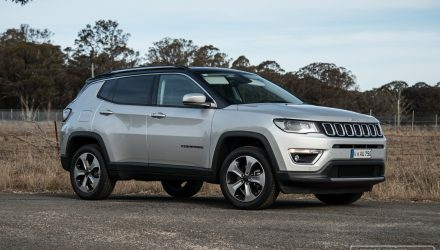 Since then the Grand Cherokee has been awarded the highly regarded US Insurance Institute for Highway Safety’s ‘top Safety Pick’. 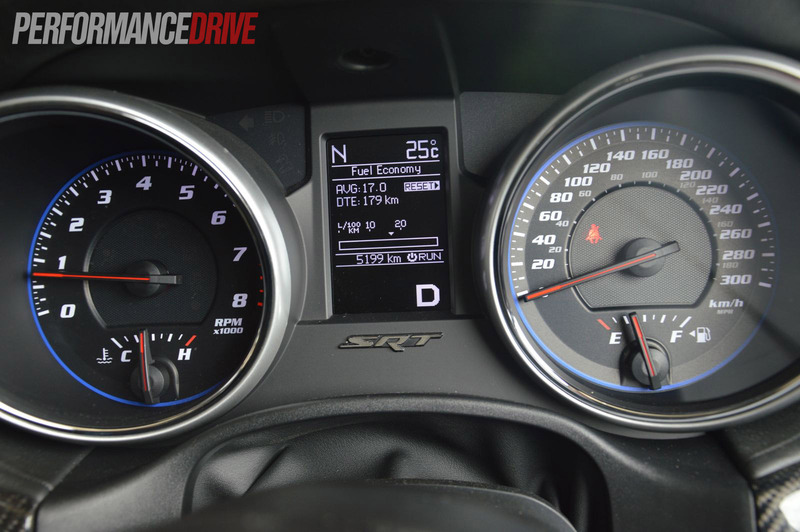 The thumping V8 soundtrack is easily the most pleasurable part of driving the SRT8. It sounds like a lion gargling through a megaphone, and then coughing each time the next gear is thud into place. 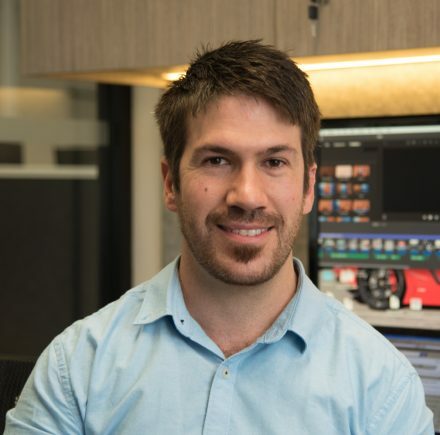 After you’re done having fun with a rampant dose of full throttle – an action that never gets tiring – the engine settles down to a rumble, like a car idling at Summernats. It’s brilliant. Engine aside though, can this huge 2336kg monster actually hustle when the going gets twisty? 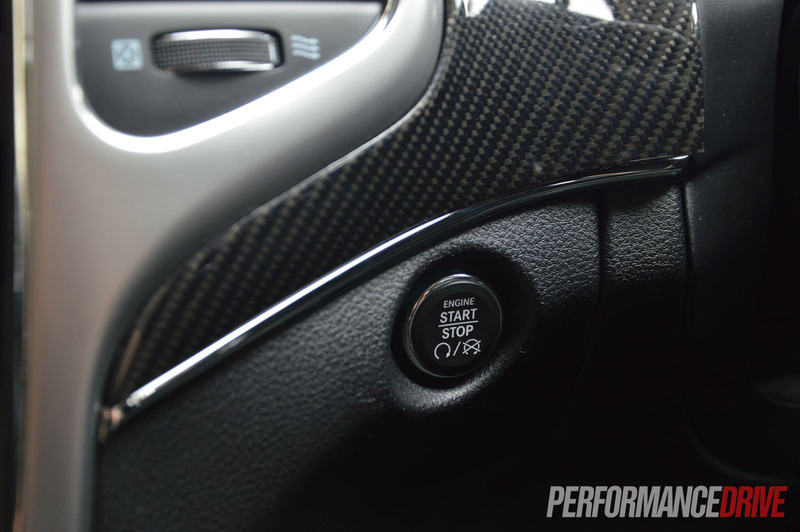 Under itermediate levels of performance driving, it’s a yes. 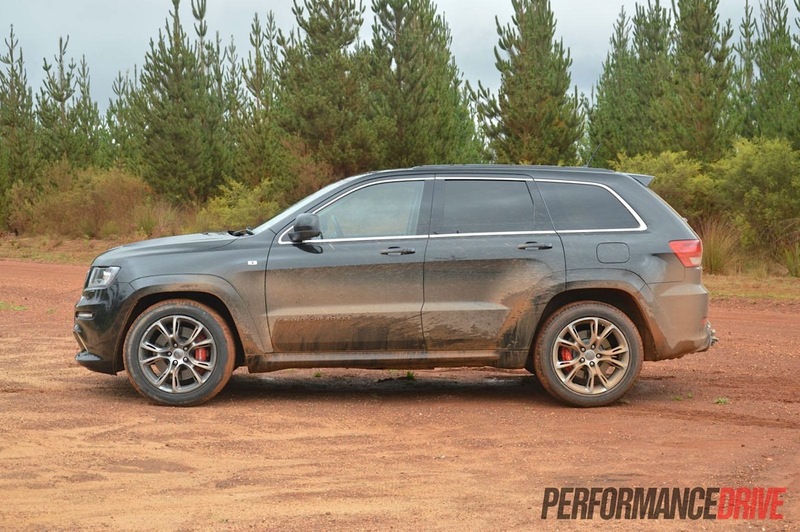 The Grand Cherokee stays composed and flat for most of the time, especially in ‘track’ mode where the suspension and steering is firmed up quite noticeably. Push the big beast further though and you will be greeted with some nervousness and after-shock tremors as the tall cabin tries to keep up with the quick-shifting underpinnings. It feels like the suspension and chassis handle too well, or too sharply for the rest of the vehicle. Again though, this is only when you’re really pushing it. Some of this sharpness is down to the steering. 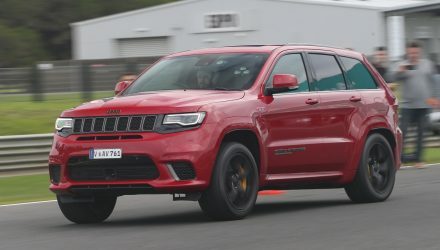 It’s not a variable ratio type, which makes for touchy highway cruising, and the gearing is quicker than the regular Grand Cherokee; 17.5:1 compared with the 18.7:1 setup on the standard Grand Cherokee. Plant the throttle off the mark and you are welcomed by a hint of wheelspin which gives you a strange feeling of satisfaction as the 624Nm turns those big 295mm tyres. We timed 0-100km/h in 5.4 seconds. Actually, the on-board computer timed it. 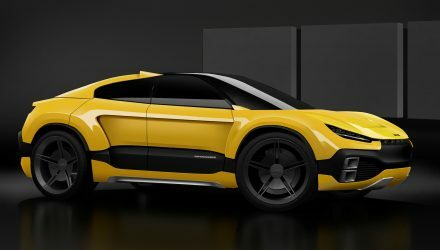 It can also time braking performance, and quarter mile times (on a private road, our best was 13.4 seconds, see the video above). Back to the 0-100km/h though, the factory quotes 5.0 seconds. During our tests we loaded the engine up on the brake and dialled up some revs before taking off. Simply planting the throttle off the mark may achieve quicker times. 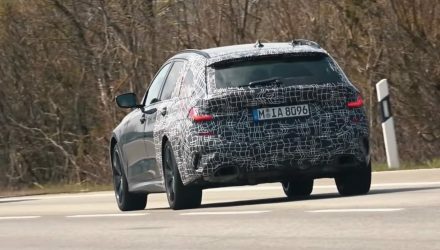 Many vehicles these days are coming out with adaptive driving modes. 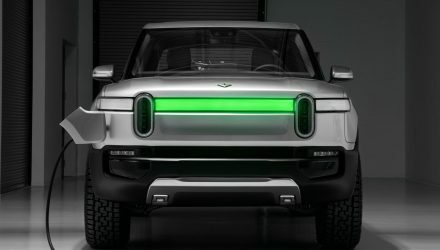 It’s a great idea as it allows vehicles to be more user-friendly and more versatile. For the Grand Cherokee the system is called Selec-Track. It allows the Jeep to trundle about town quite happily in auto mode. 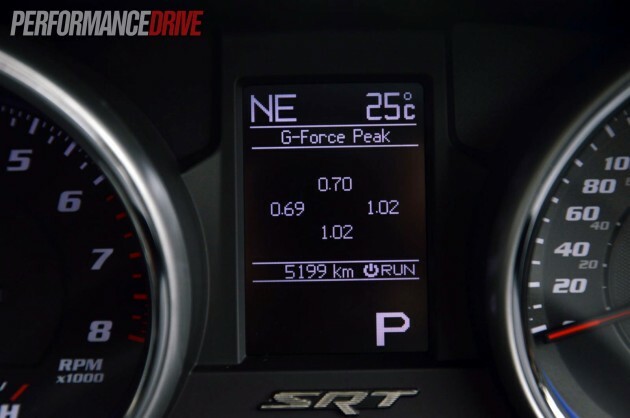 We feel gear shifts are made a touch high in the rev range than what is needed, potentially tarnishing fuel economy. 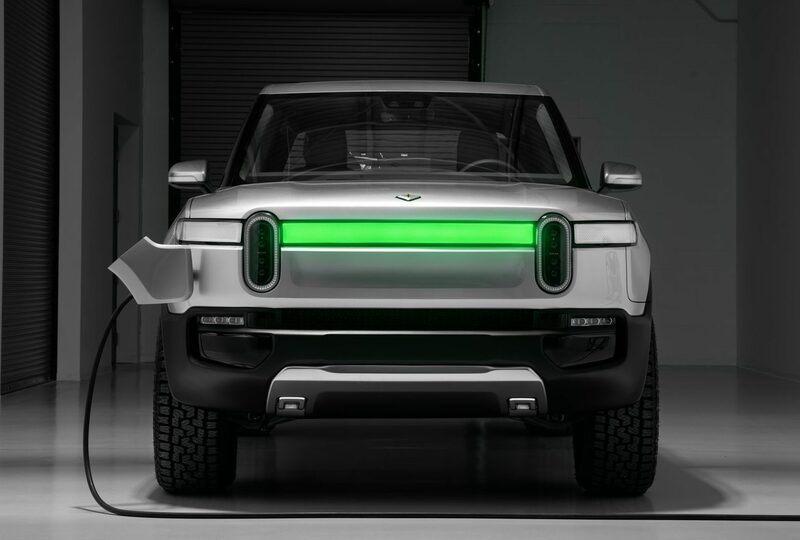 The upshot is you get to hear that clapping metallic V8 drone. The auto mode also offers a relaxed ride setting, which, we found, does seem to shudder a touch on undulated and corrugated surfaces. This is when the ‘sport’ setting is needed. In sport mode the Grand Cherokee is a sports car. The ride is firm enough without turning uncomfortable, and the steering feels a bit more eager and enthusiastic with increased weight and feel. Track mode provides the firmest suspension setting. We think it’s absolutely perfect. If you like a proper sports car feel that’s direct and communicative, this is the setting for you. Bilstein is responsible for some of the best dampers in the world, and we have no complaints in this department, in this setting. You always know what the wheels are doing and you can feel that they are always firmly planted on the road or dirt. 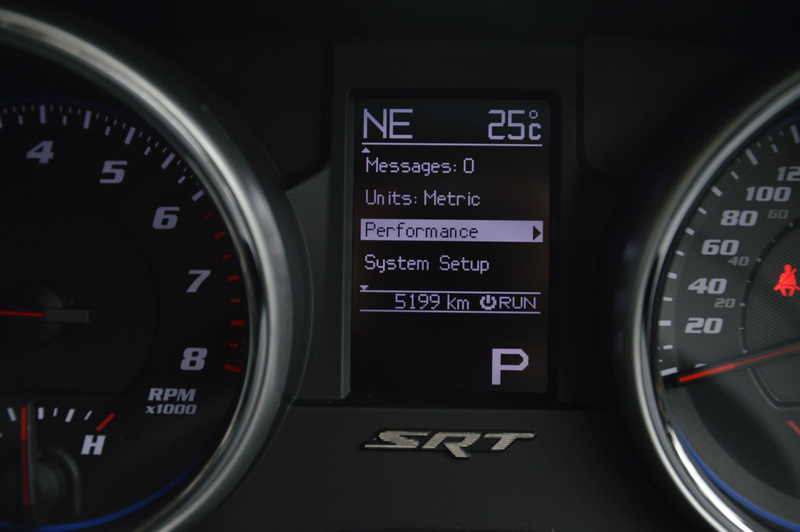 The SRT8 does come with some fuel-saving technologies, such as cylinder-deactivation and stop-start, however, fuel economy is at the expensive end of the scale. 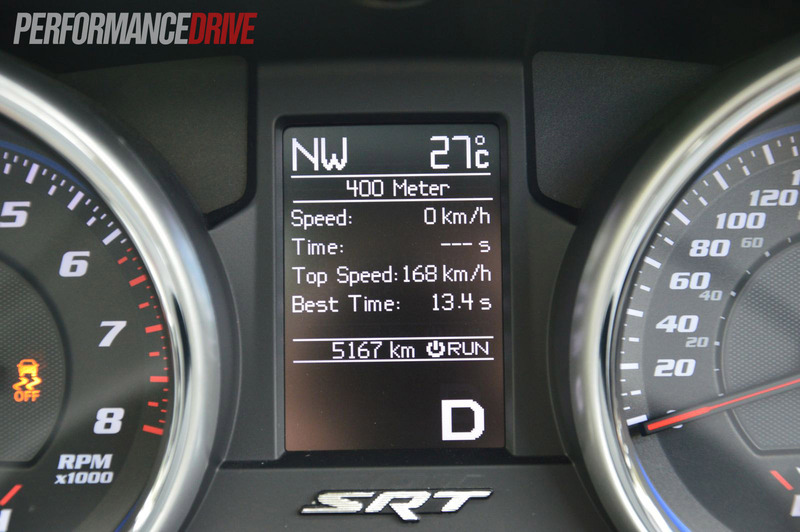 We averaged around 16.5L/100km during our test, which included a mix of freeway driving and city driving. Out on the freeway the engine revs at around 2500rpm, which is a touch too high for maximum economy. 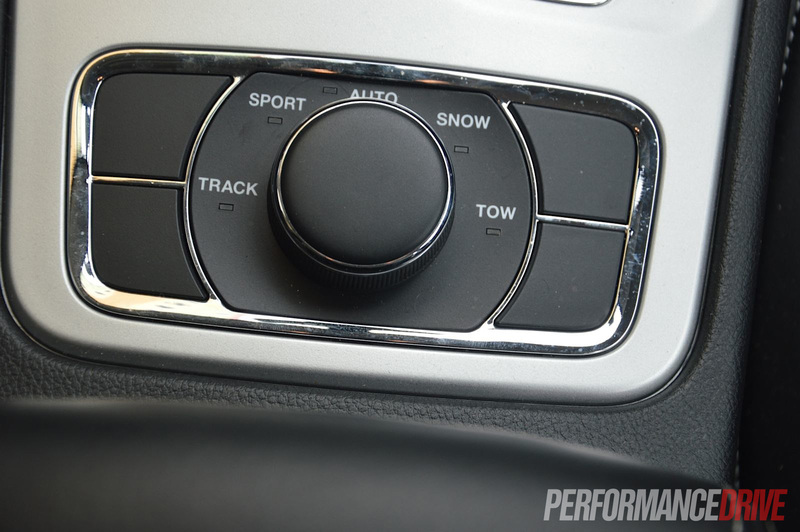 The new eight-speed auto due with the facelift later this year should change that. On the dirt, in track mode, it really does sound, and feel, like you’re driving a monster truck. 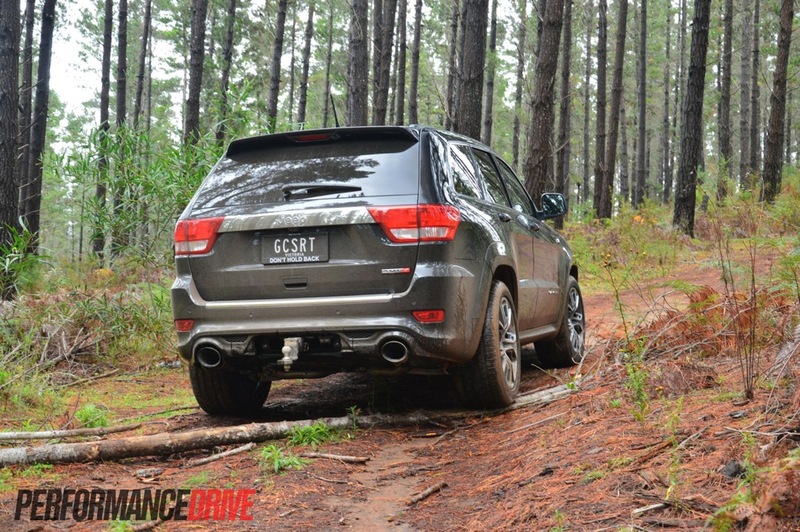 The suspension is, in our opinion, technically perfect for mild off-road use. In fact, we’d even go as far as saying we haven’t come across a better setting in an SUV off the road ever before. 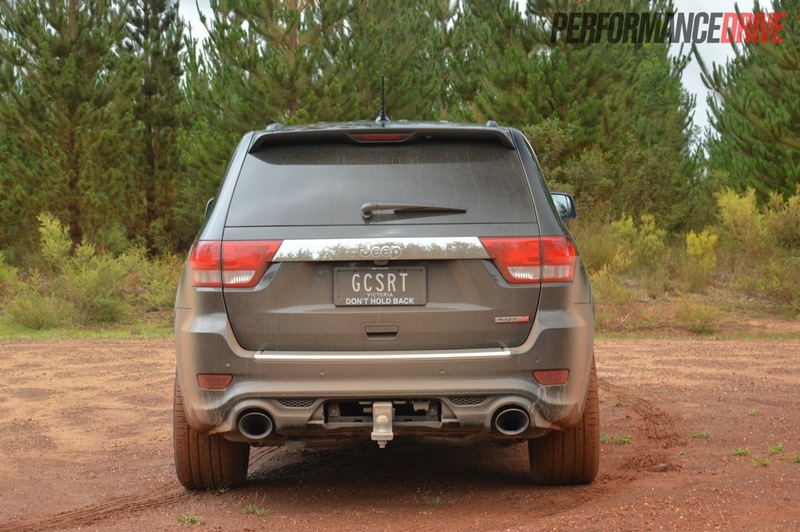 It simply irons over ruts and bumps, and even over harsh corrugated dirt roads, the Grand Cherokee SRT8 remains smooth and comfortable. 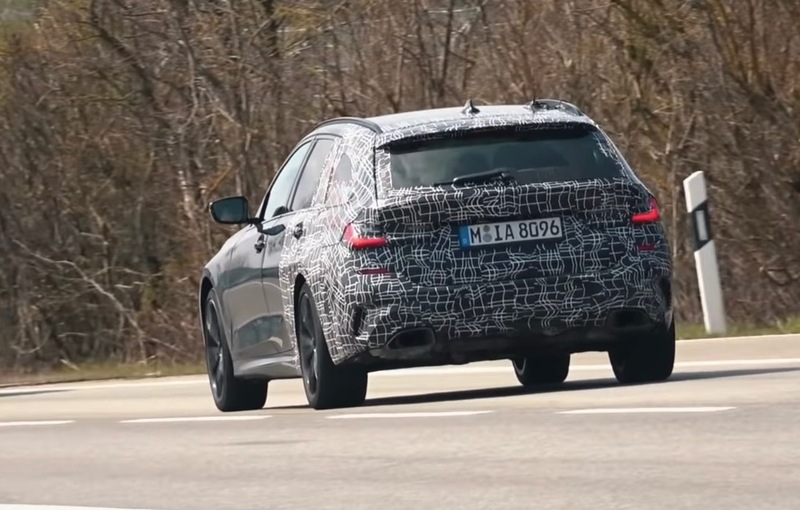 This could be partly down to those 20-inch alloy wheels and the relatively high-profile 295/45 tyres. Thanks to the clever electronic limited-slip differential at the back, wheelspin is almost impossible while on the go, even on muddy dirt tracks. The running gear calculates what wheels have the most traction and sends power to them, pretty much instantly, and continuously calculating. 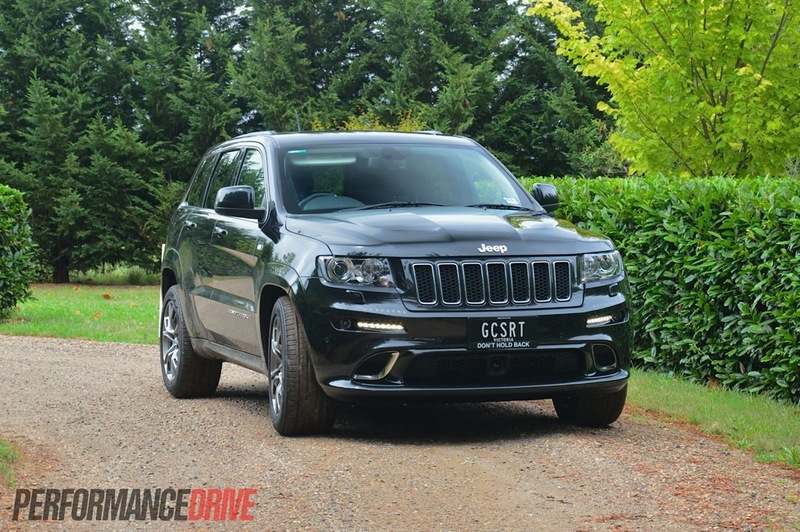 Hit some more technical terrain and the Grand Cherokee behaves like a proper off-roader. 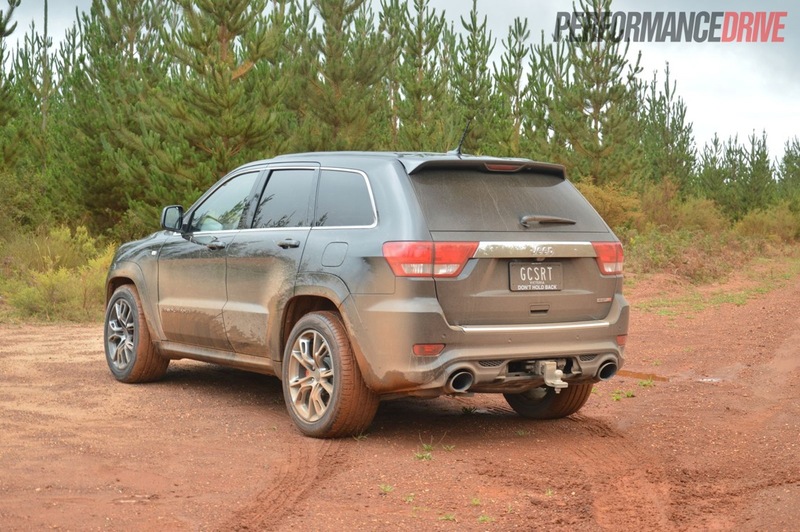 It can climb up fairly rugged rocks and mounds, however, the SRT8 does suffer a bit from the lowered ground clearance (184.9mm). 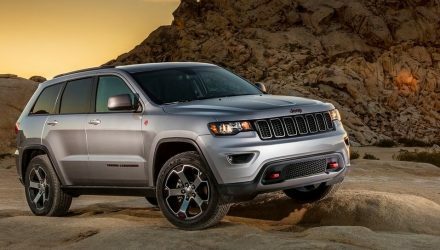 For more serious off-roading you need the regular Overland turbo-diesel (177kW/550Nm) or V6 petrol (210kW/347Nm) Grand Cherokee. 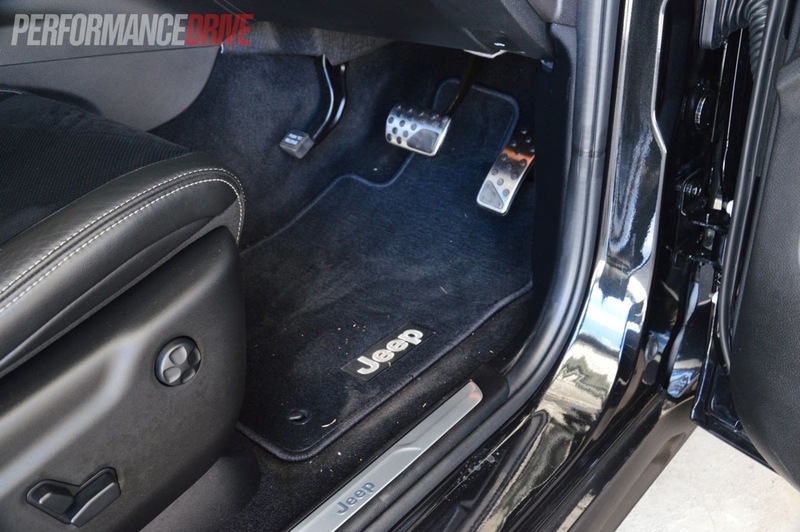 These come with a ‘Quadra-Lift’ air suspension setup which can raise the Jeep from 205mm to 270mm. We have to enjoy vehicles like these while we can because chances are they won’t be around for much longer. 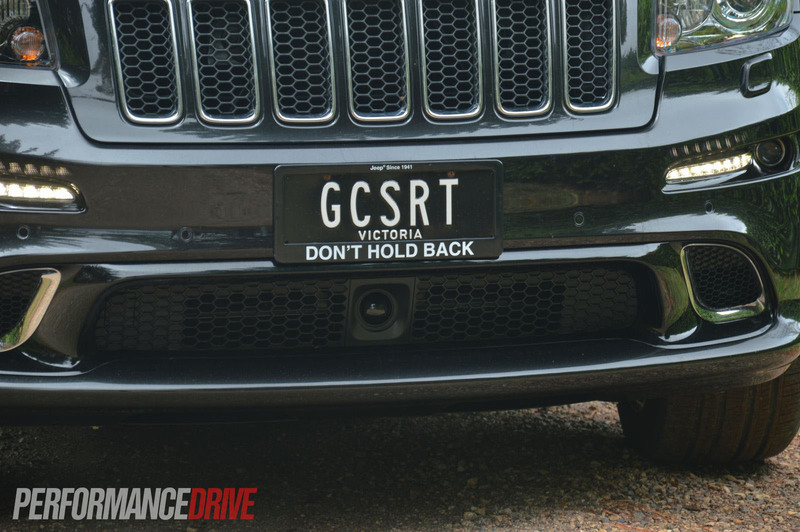 As we mentioned earlier, the 2013 Jeep Grand Cherokee SRT8 is one of those vehicles created almost entirely for the sake of fun. It purposely, and very obviously, steps outside the ordinary to provide extraordinary. And for that reason, it gets a lot of respect. We experienced plenty of hat-tips and ‘nice car mate’ during our test. It may not be as refined or as dynamic on the road as its rivals, but it more than makes up for it with heaps of standard equipment, an addictive V8 engine, and of course that friendly and welcoming price tag (in comparison). 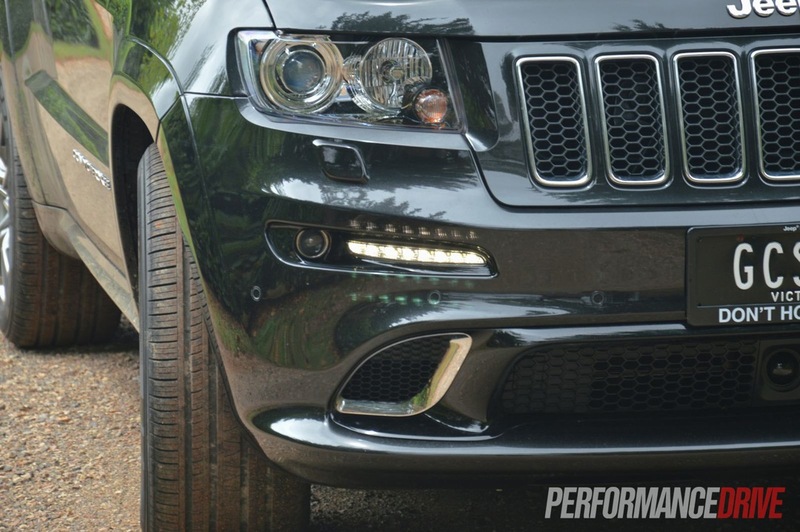 The ball-tearer SUV from BMW’s performance M Division. 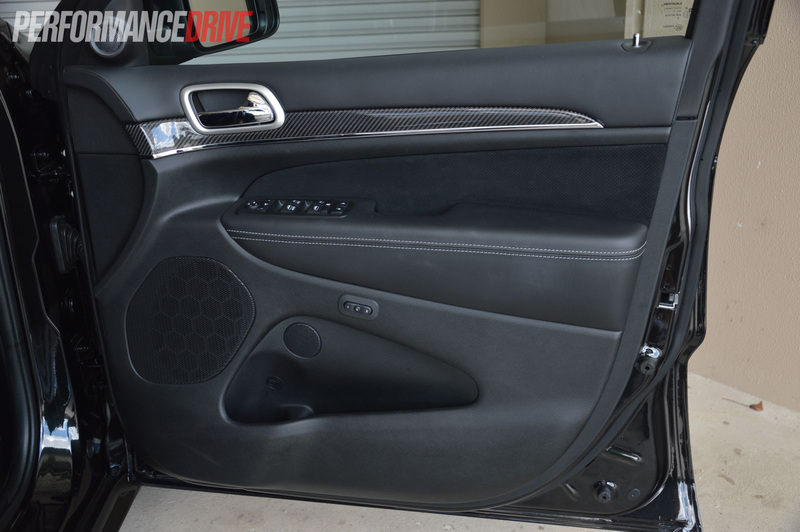 It’s filled with all kinds of luxury and topped off with M engineering which has been honed and tested on various race tracks, including the Nurburgring. Rather expensive though. 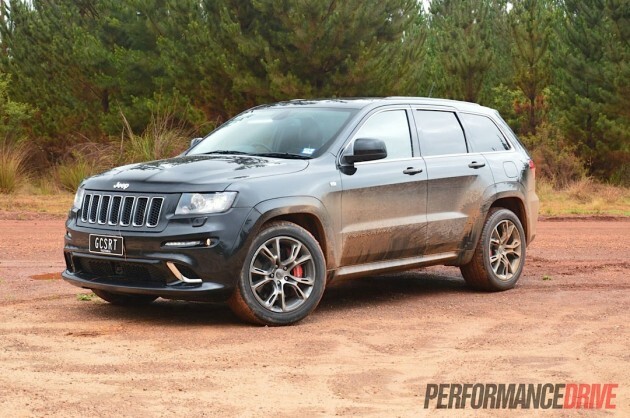 Like the SRT8 only badder and better in almost every way. 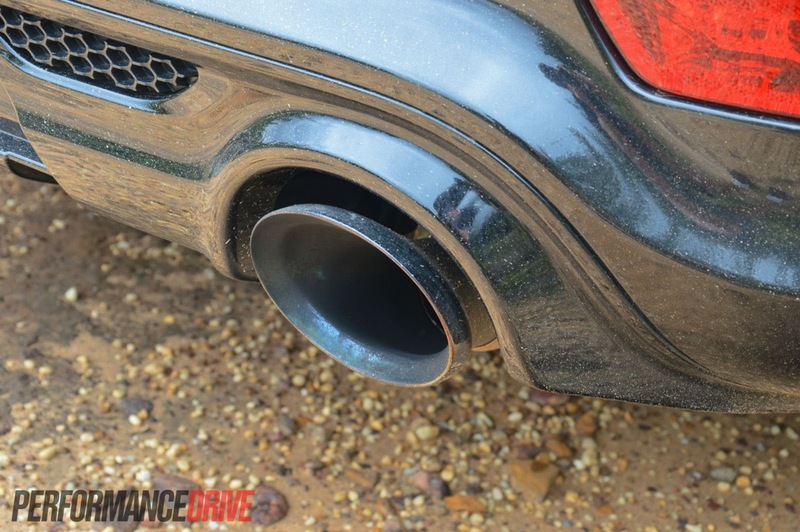 Huge grunt from the biturbo V8 engine, matched with high performance brakes and suspension. Like the BMW above, it is rather expensive.